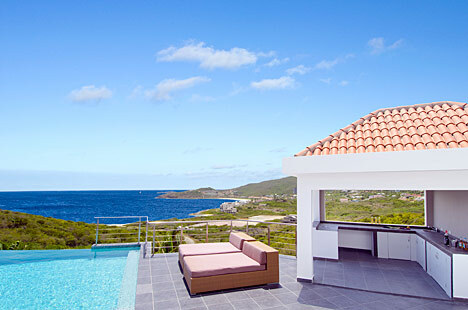 Villa Sea La Vie is a wonderful, new 4 bedroom/5 bathroom villa located in the gated community of Red Pond Estates on St. Maarten. 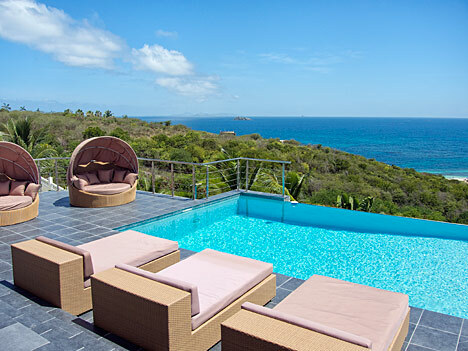 The villa offers breathtaking views of the ocean and the neighboring island of St. Barths in the distance. 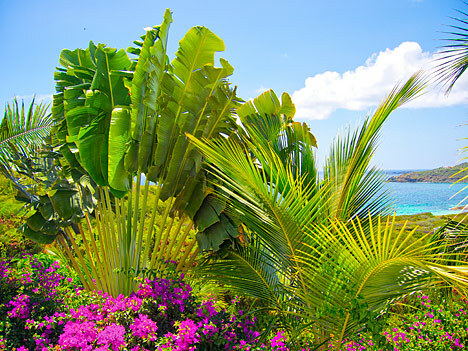 The villa's two-level space, rooms, terrace area and private pool join together in a flowing space and are bordered by lush foliage. 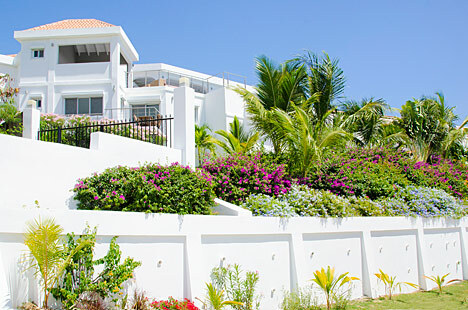 This villa is the perfect mix of modern and Caribbean style. 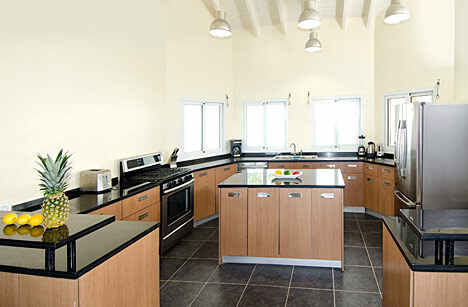 The main level offers spacious, open concept living and dining areas which are elegantly furnished. 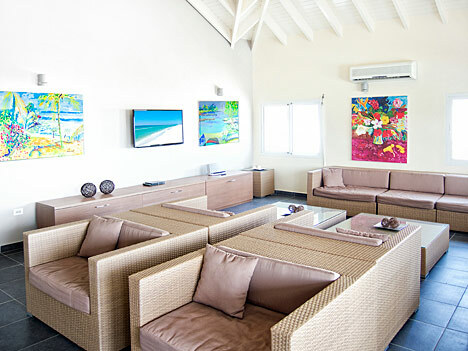 The indoor dining area offers seating for up to 10 persons...The living area is spacious, comfortable and offers a large flat screen television with Satellite TV, DVD/CD player and IPod Dock. 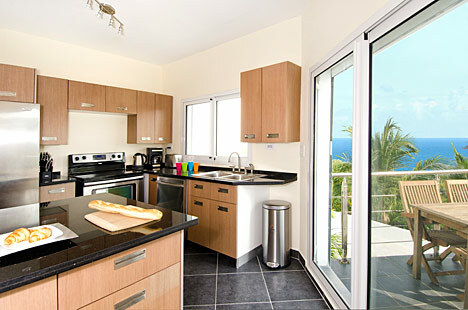 The immaculate kitchen with granite counter tops is fully equipped with modern state-of-the-art deluxe stainless steel appliances, place settings, silverware & accessories and fully equipped for you to make that gourmet meal. 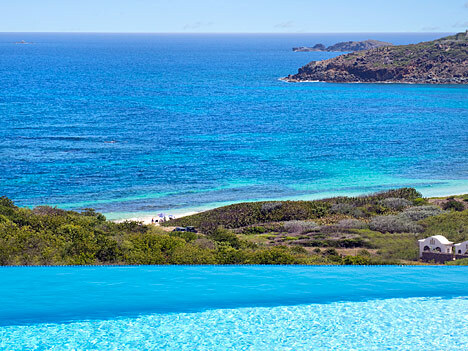 Large sliding glass doors open onto the outdoor terrace area with infinity pool where you may enjoy the wonderful views and gentle trade winds. 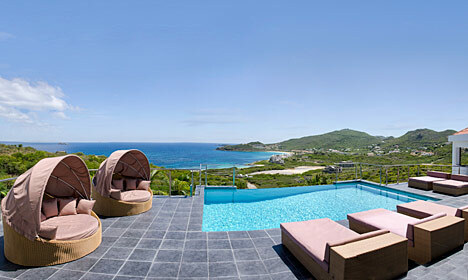 By the pool area, there are comfortable lounge chairs for you to bask in the Caribbean Sun...Enjoy the outdoor bar area under the Gazebo, dining area for 10 persons under the covered terrace and there is a gas BBQ grill for your use. 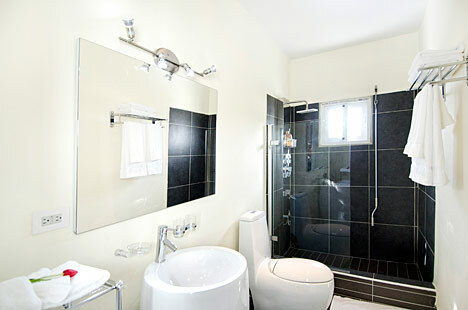 In addition, there is a bathroom with shower for your use as well by the Gazebo/bar area. 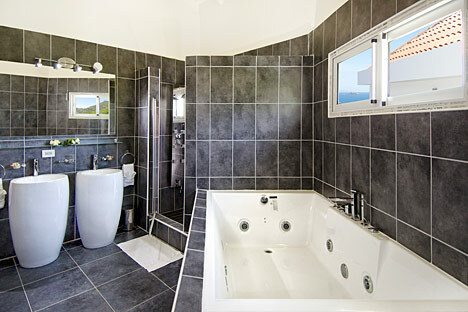 The master bedroom is located on the main level of the villa and offers a king size bed, walk-in closet, personal safe and en-suite bathroom with Jacuzzi Tub, double sinks and shower. 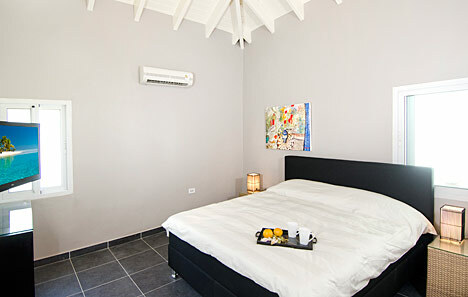 The 2nd & 3rd guest bedrooms are also located on the main level of the villa and offers a king size bed, closet space and en-suite bathroom with shower. 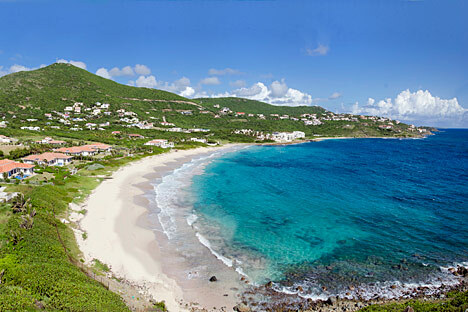 The villa is located in Red Pond Estates where you may walk to a small secluded beach within minutes , conveniently located to the ferry service from Oyster Pond to St. Barths; just a short drive to Dawn Beach & The Westin Resort & Casino; 15-20 minutes from Orient Bay, the center for water sports on the island; 10 minutes from Philipsburg the center for the best shopping on the island and 20 minutes from Grand Case where you will find the best "French Restaurants on the island." At Sea La Vie, have a truly memorable experience... Watch the spectacular sunrise... enjoy the panoramic views while sipping a cocktail on the spacious decks... have a bar-b-que under the stars... take a dip in the pool while overlooking the scenic setting or go down to Dawn Beach, one of the best snorkeling beaches on the island. 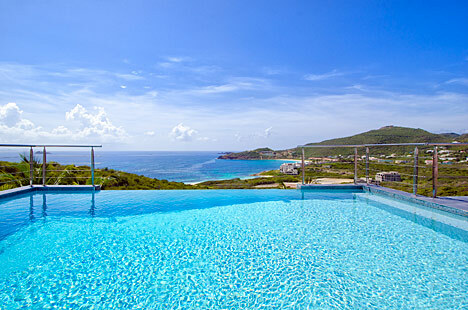 Pool: Enjoy the large spaces of the terrace and infinity pool (10 x 5 meters)...By the pool area, there are comfortable lounge chairs for you to bask in the Caribbean Sun...Enjoy the outdoor bar area under the Gazebo, dining area for 10 persons under the covered terrace and there is a gas BBQ grill for your use. 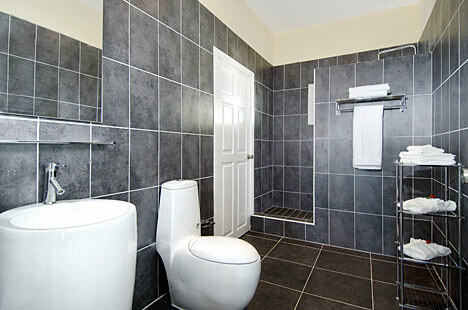 In addition, there is a bathroom with shower for your use by the Gazebo/bar area. 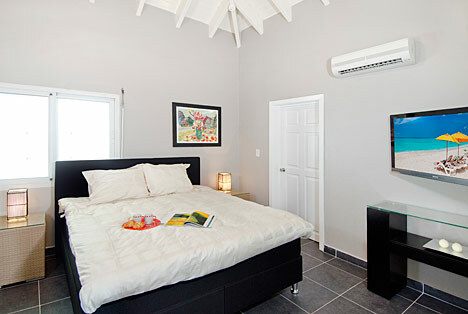 Bedroom 2 - Located on the main level of the villa - Garden view, king bed, air conditioning, ceiling fan, flat screen Satellite TV, DVD player, closet and en-suite bathroom with shower. 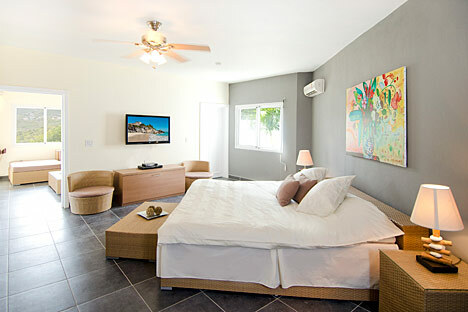 Bedroom 3 - Located on the main level of the villa - Garden view, king bed, air conditioning, ceiling fan, flat screen Satellite TV, DVD player, closet and en-suite bathroom with shower. 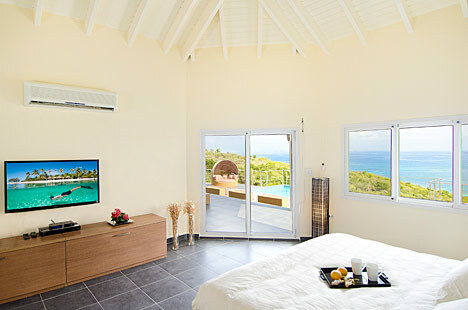 Bedroom 4 - Located on the lower level of the villa - Full 1 bedroom apartment that is accessible from within the villa or from its own private entrance...King bed, air conditioning, ceiling fan, flat screen Satellite TV, DVD player, walk-in closet, personal safe and en-suite bathroom with shower. 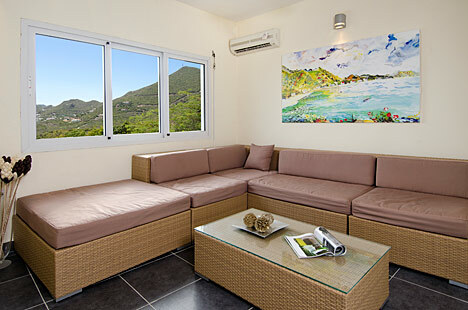 Bedroom 4 also offers a living area, fully equipped smaller kitchen and an outdoor terrace area with a table and four chairs. 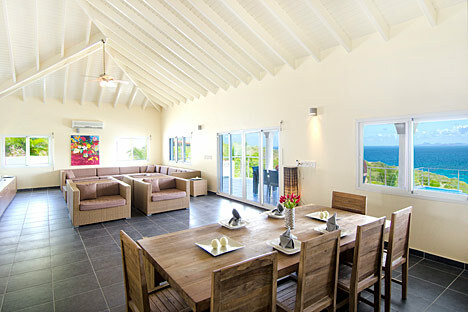 The living/kitchen area offers ocean views and the bedroom offers garden views. The impeccable modern kitchen with granite counter tops offer a breakfast bar with 3 bar stools, center island and lots of counter space...It is fully equipped with state-of-the-art deluxe stainless steel appliances to include gas stove, oven, dishwasher, wine cooler, microwave, refrigerator, toaster, blender, coffee maker and a full supply of china, glasses, cooking utensils, crockery and pots. 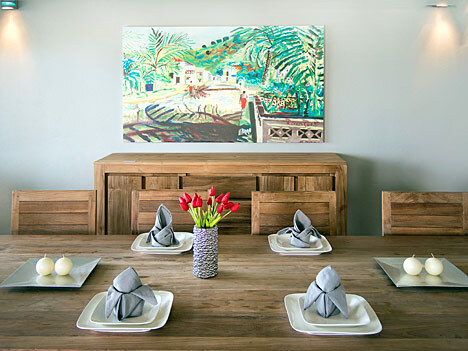 The main level offers spacious, open concept living and dining areas which are elegantly furnished in the perfect mix of modern and Caribbean style. 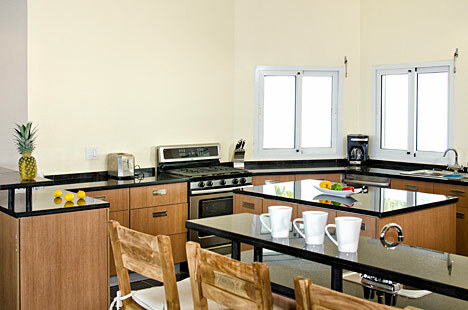 The dining area offers seating for up to 10 persons...The living area is spacious, comfortable and offers a large flat screen television with Satellite TV, DVD/CD player and IPod Dock. 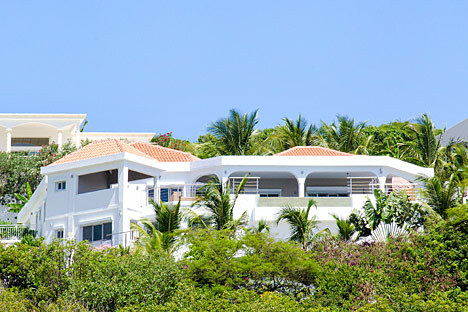 Spectacular views; air conditioned bedrooms & living room; ceiling fans, high-speed wireless internet connection; Satellite television and DVD player in all bedrooms; Satellite television, DVD/CD player & IPod Dock in living room; outdoor bar/gazebo area; re-chargeable cell phone; washer / dryer; gas BBQ grill; keypad lock; electric gate; located in a gated community; voltage - 110V. Bigger pictures can be found on another page. 1 bedr. 2 bedr. 3 bedr. 4 bedr. 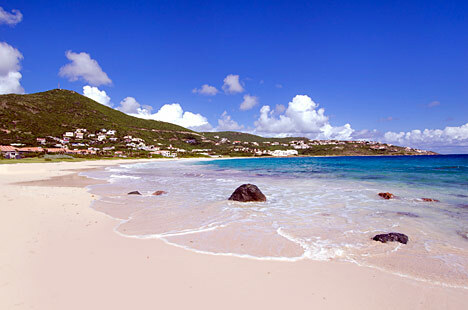 Contact Annemarieke Jongsma - call toll free 1-888-71BEACH or e-mail sxm@gobeach.com for latest availability. 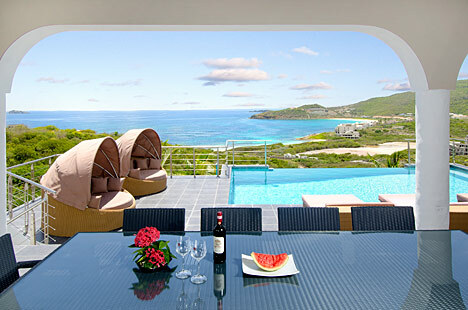 Since I have seen almost all villas, I can also give you some other recommendations if needed.